Stay tuned to site updates via our news blog's RSS feed or on Twitter! Use the hashtag #ISML in your posts. While ISML is officially run and managed in English, we give our best effort to make voting and other site features accessible to non-English visitors. Our resources are unfortunately limited, so we are very grateful to discover communities around the world that are independently helping to share ISML in additonal languages. 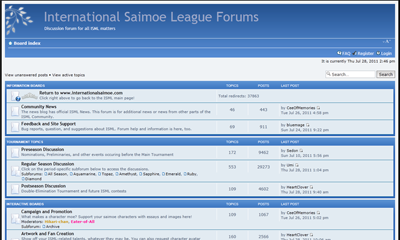 We are happy to list blogs and journals that chronicle ISML events. All languages are welcome. We invite anyone in the community to create videos for ISML and submit them for consideration. For buttons, banners, and signature slivers, visit the promotional artwork portal. If possible, please make a copy of the images and use your own image hosting provider as the source. Unicode (UTF-8) capability in your browser is required for displaying some character names. Many features of the site may be incompatible with Internet Explorer versions 6 and earlier. The following individuals have volunteered their time and skills to making ISML the best tournament it can be. The League is thankful for all of their continued effort and dedication. mokuhazushi ("Moku") was responsible for upgrading ISML's servers toward the end of the 2008 season, increasing our ability to meet rising traffic demands and enhance everybody's browsing experience. He donated the funds needed to maintain the site for an entire year and provided excellent programming to keep our voting polls open, on time, and running smoothly. Moku passed away in August 2009 after a long battle with colon cancer, and we miss him dearly. Since that day, the Staff have continued to support ISML and strive for its success in his memory. Contact the Staff by emailing [email protected]. We welcome your comments, questions, and/or concerns. ISML began as a personal project funded by the current staff members, but our recent growth has begun to exceed our original budget. Participating in ISML will continue to be free of charge to you; however, we will graciously accept any gifts and offerings from our voting community if anyone wishes to contribute. All donations will pay for present and future server- and site-related expenses and upgrades.